This iExpression makes the source text of a text layer scroll through the screen from left to right (or right to left). If the text consists of more than one row, each row is interpreted as a separate news and between the news a customizable separator text can be inserted. is a string that is inserted between the different lines of the original text (i.e. the different news messages). determines how fast the text moves. A value of 10 means every minute 10 new letters become visible. 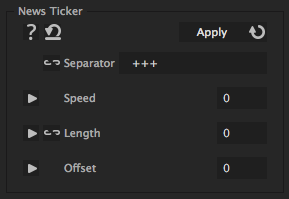 For negative values the text moves from left to right otherwise it moves from right to left. How long the visible text should be (number of characters). To make the entire text visible, you can also set the length to 0.
allows to start the news ticker not with the beginning of the first news message but at any position in the text.